The Association of Canadian Universities for Northern Studies (ACUNS) recognized Wilfrid Laurier University students James Telford, Nick Wilson and Katherine Black for their northern research. Telford received the 2016 W. Garfield Weston Award for Northern Research at the master’s level. The award honours academic excellence, high calibre research proposals and commitment to northern research. He is working with Laurier Associate Professor Brent Wolfe and Roland Hall, professor at the University of Waterloo. Telford was invited to work with the Tlicho First Nations community in Canada’s central Northwest Territories to establish a long-term aquatic ecosystem-monitoring program in the Marian River Watershed as part of the Marian Watershed Stewardship Program. The health of the Marian River watershed is a vital part of the Tlicho’s fishing and hunting practices and is an important route for transportation. His research aims to create a long-term baseline of natural metals variation in sediment that can be used as a foundation for measuring changes to the aquatic environment. The baseline data can be used to identify future pollution from industrial mining projects and to identify long-term changes in hydrology and ecosystem characteristics that are being affected by low water levels as a result of climate change. Telford is currently enrolled in Laurier’s Masters of Science program in Geography and Environmental Studies. He completed his undergraduate degree in Geography and Environmental Studies at Laurier, and is also the recipient of the Natural Sciences and Engineering Research Council (NSERC) Undergraduate Student Research Award. Wilson received ACUNS’ Caribou Research and Management Award. The award recognizes research that contributes to the understanding of barren-ground caribou and their habitat. He is working with Laurier Geography and Environmental Studies Professor Michael English and Associate Professor Colin Robertson. Wilson’s research is focused on the Bathurst Caribou Herd in the Northwest Territories, where populations of the Bathurst Caribou Herd have declined by 95 per cent since 1996, from 400,000 caribou to 15,000. Wilson examines how a change in snow pack patterns has led to changes in caribou migration patterns, feeding habits and their vulnerability to predators. Less snow has resulted in drier forests and an increase in forest fires, which destroy the caribou’s food source, affecting their ability to breed. Snow that melts and refreezes is also more difficult for caribou to tread through, which expends more of their energy and makes them easier targets for predators like wolves. 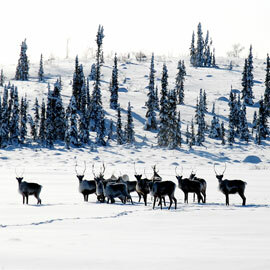 The Bathurst Caribou Herd holds a large cultural and subsistence value for northern communities. Wilson is currently enrolled in Laurier’s Masters of Science program in Geography and Environmental Studies. He completed his undergraduate degree in Environmental Studies at Laurier. Wilson will be travelling to the Northwest Territories in September to continue his research. Black also received the 2016 W. Garfield Weston Award for Northern Research at the master’s level. Black is working with Laurier Associate Professor Jennifer Baltzer in the Forest Ecology Research Lab and at a remote field site at Trail Valley Creek near Inuvik in the Northwest Territories. Read more about her research. The W. Garfield Weston Foundation is a champion of northern research, raising the profile of northern science and positioning Canadian scientists to contribute in ways that are pertinent, timely and innovative.